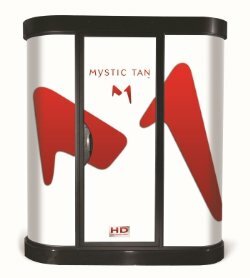 Experience Sunless Tanning in High Definition with the Mystic HD. It is an evolutionary sunless and heated treatment that delivers flawless, natural looking results while keeping you warm and dry from start to finish. From the moment you enter the warm, inviting environment, your skin is infused with heat, which allows for maximum absorption, creating a deeper, longer lasting high-definition colour. A sweeping airbrush travels gently from head to toe, applying precise amounts of your desired level of colour. Light: Produces results up to 2 shades darker than your natural skin tone. Great for light to light/medium skin tones. Medium: Produces results 2 to 4 shades darker than your natural skin tone. Great for medium to medium/dark skin tones. Dark: Produces results 3 to 5 shades darker than your natural skin tone. Great for medium/dark to dark skin tones. iTAN offers Mystic Add-ons to personalize your experience. Choose from Aromas to leave you smelling fresh, Bronzers to give you that extra boost of cosmetic colour or Enhancers to give you the most out of your Mystic Sunless Tan. With these you can achieve your desired results. Sticky Feet are also available in store. Use these to prevent the bottom of your feet from saturating. Place “Sticky Feet” on the ground. Remove cover and step in the center of the mold. This will prevent any saturation on the bottom of your feet. Do not shower or do any physical activity for at least 6 to 8 hours after your Mystic session, as the DHA continues to develop. Moisturize on a daily basis, especially after you shower. Avoid exfoliating your skin until you are ready to tan again. Please Note: Salt water and chlorine will affect the life of your Mystic tan.